Keep the QB clean by turning your offensive line into an impenetrable wall. 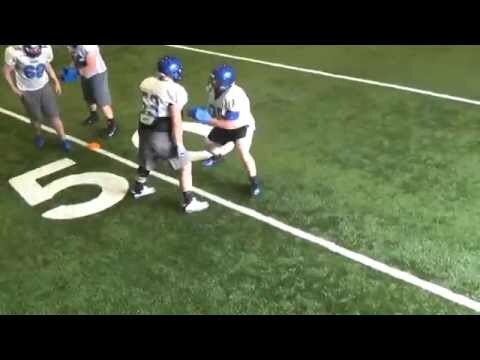 This drill filmed at the University of Dubuque features The Muzzle® magnetic offensive line training equipment. The Muzzle® develops proper hands-in, thumbs-up technique while putting a premium on proper footwork. Offensive linemen who get in the habit of reaching will get lazy with their footwork, leading to missed blocks and holding penalties. Practicing at game speed with The Muzzle® eliminates grabbing and will reduce costly penalties on gameday. Football training equipment from Krausko is trusted by college football coaches at every level.